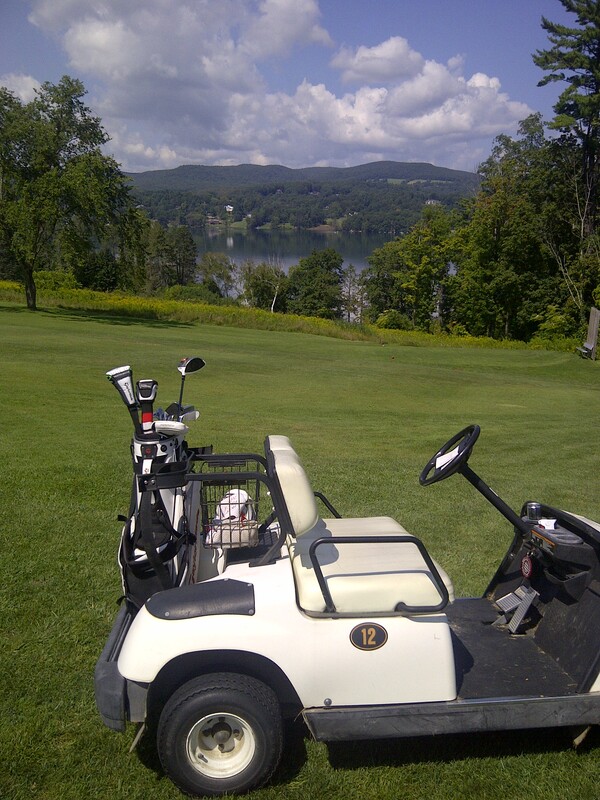 The Hotchkiss course is located in the Northwest part of the state at the foothills of the Berkshires. This beautiful nine holer sits on top of a hill and circles right around and through the campus. The school is in a very small quiet town called Lakeville(the lake being Wononskopomuc….good luck saying that). Upon arriving at the course the driveway takes you right by their new synthetic turf football field(2009). This is the only course I have played on a school campus and its was pretty cool that the football field was so close to the course itself. Being that the holes are not on top of eachother and spread out through the campus, there is a map on the back of the scorecard which was very helpful. Although hole #5 provides the best view(see below), I do not have one favorite hole here. I love holes 2-6 as I can only imagine during school days how many students are not paying attention to their professors but rather seeing if you stick the green or go up and down. Check out the view from hole 5. My favorite part of this course is if you are lazy,I played 27 already that day, you can take a cart and they are all drop tops!!!! Nothing better than riding and still getting tan. If your son or daughter likes hockey and golf and is looking at prep schools this is a no brainer. Overall a solid 8 and if they had all nine holes on the school side somehow without crossing a main road, this course would be even better. LOVE this place and can’t wait to go back.